This was tough winter fishing. Not a lot of fish about but those that came on board were absolute beauties. 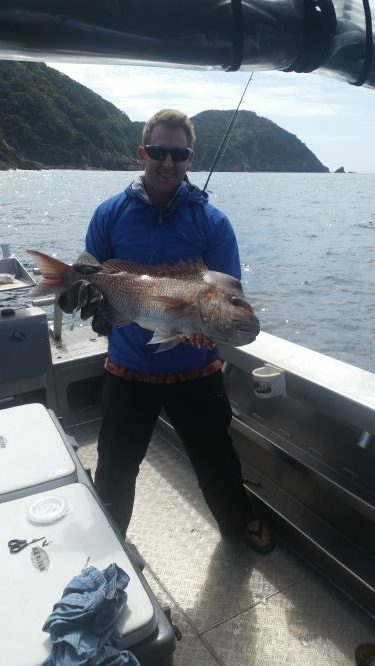 Estimated weight of this trophy snapper was in excess of 8kgs. This was caught stray lining with one of Fishmeister’s hire rods, the Shimano Thunnus, floating pilchard with no weight and Jason did a great job to land this fish. We tried to release this beauty but unfortunately the struggle was too much for him and he wouldn’t have survived. Instead the plan was to send him off to the smokehouse for everyone to enjoy.